Make word documents look great with some amazing visual diagrams. With an automatic diagramming program, you can quickly and easily turn a plain-looking document into one that looks professionally designed and visually pleasing. Want to add diagrams to your word document? It is said that a picture is worth a thousand words. Inserting some visuals into your document makes it persuasive and attractive. Start with predefined, coordinated designs and then customize to suit your needs. Edraw makes it a snap to create a diagram that supports your text, whether it's a mind map, an organization chart, a flowchart, a set of tasks, or something else. Over 200 kinds of diagrams can be generated effortlessly via Edraw. You can use themes to refine the look and layout. If you are time-crunched, work with a template. The easiest way to create more elaborate documents for Word is to use a template. Edraw has thousands of them, from pie chart and bar chart to business cards and fax covers. To get started, go to File > New in the left navigation bar, and then choose a diagram type, which brings up a selection of popular templates topped by the search box. Double click a desired one from the example panel to edit it. These templates come with images and dummy text, both of which are easily replaceable with your own (you can either double click on a shape and start typing, or paste in text or images you've previously copied). But even if you want to change design elements (such as fonts, for example), you might start with a template just to pick up preset shapes and other basic layout parameters that would be annoying to create from scratch in Word. The whole process may only take 5-10 minutes. 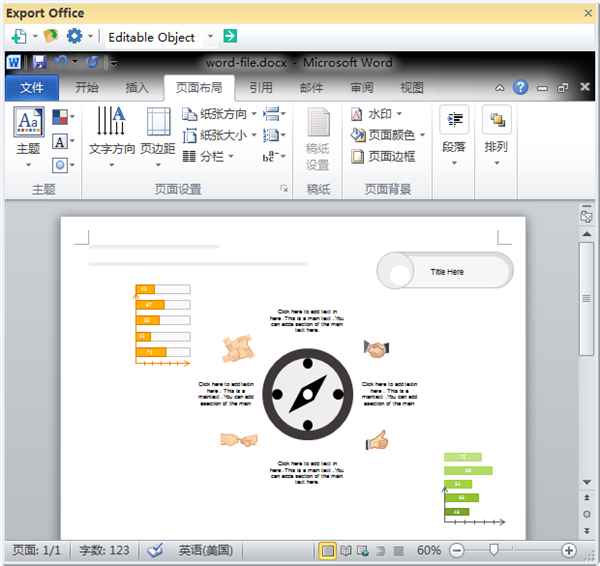 After the diagram is completed, export it into Word format. 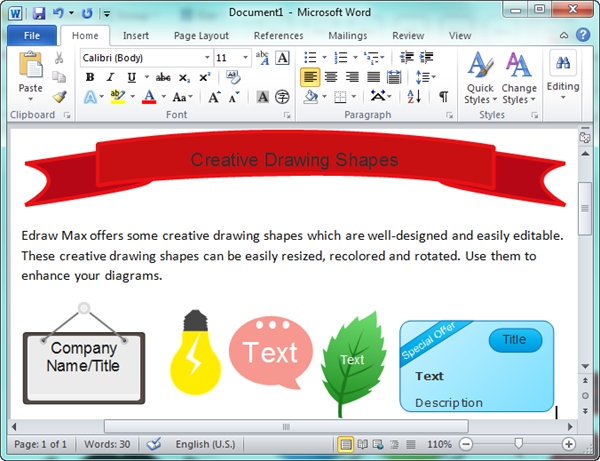 The MS Word document window will open within Edraw. The diagram is exported to a MS Word document immediately, in editable format. Watch the demo to see how easy it is to give a plain document a professional-looking makeover, and then give it a final polish with titles, borders or beautiful clipart. Currently, there are over 8500 pre-drawn symbols available, which keep increasing every day. Some symbols are all smart vector shapes that have been designed with auto generation functions. 1. 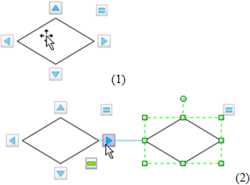 Move the pointer over a basic flowchart shape. Its blue AutoConnect Arrows show. 1. Select a mind map symbol. 2. Click the floating button to add a new symbol at the next level. Select an org chart shape, then you can click the quick button to add subordinate or colleague fast. 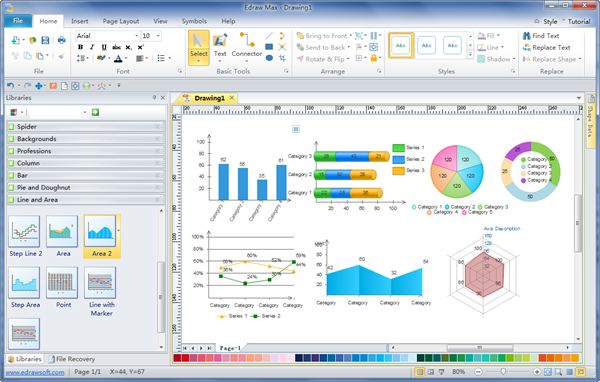 You can directly copy shapes from Edraw and paste them into Word documents. Since they are in vector format, you can freely enlarge them and they still remain clear. They can help you visualize and communicate ideas more intuitively. Besides, some 3D shapes are also readily available, such as 3D directional map symbols and 3D block symbols. Click relevant link to learn how to make diagrams of various kinds.